"Three days in that hallway hardly moving. He came up the stairs to the apartment like he knew I'd be waiting. And then he was dead. I cleaned up fast and cleared out. Not a bad job even if I say so myself. Gepetto was right. I have the ZATO documentation and the artefact specs. I'll drop them in the usual place." The line between spy and criminal is often so thin as to be invisible. A good spy needs to lie convincingly, break in to places he or she doesn't belong, forge documents, steal secrets, blackmail potential informants and, when all else fails, kill with ruthless efficiency. Above all, they need to evade capture while doing all these things. Section 46 operates even further in the shadows than most intelligence organisations. Their activities are unsanctioned, their methods brutal and their enemies inhuman. 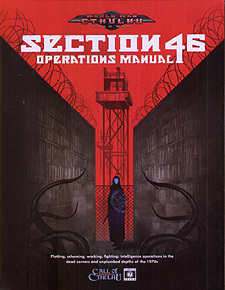 The Section 46 Operators Manual is a handbook for World War Cthulhu: Cold War players, designed to teach them how best to succeed and survive in this murky world of 1970s espionage, or at least how to delay the inevitable for as long as possible.